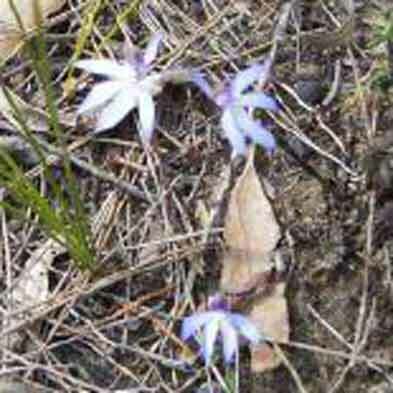 The Kurri Woodland occurs only in the Kurri district, on poorly-drained sandy soil that was once part of a salty, marine environment. 2. 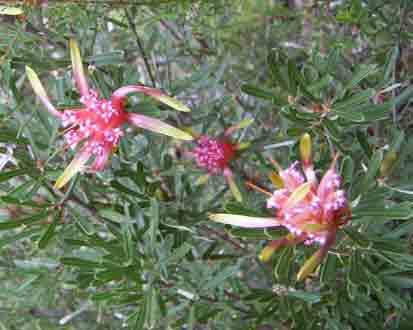 Grevillea parviflora subsp parviflora - Pink Grevillea, new listing. (TSC Act S2) . Note:- this list doesn't attempt to describe all the plants of the KSSW. 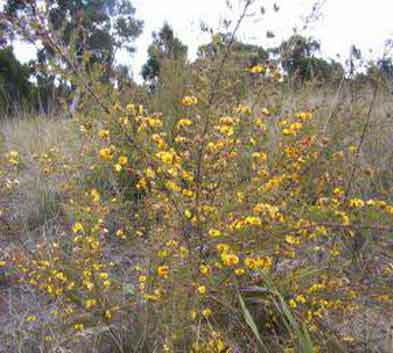 Acacia elongata - Slender wattle, upright in habit, reaching 7 m, with long, bright green curved phyllodes (leaves). Bright clear yellow clusters of flowerheads in Spring. Acacia myrtifolia - Small, red-stemmed wattle. Pale yellow flowers. Acacia ulicifolia - One of the plants known as "Prickly Moses". Hairy branchlets, crowded phyllodes. Large pale creamy yellow flowerheads. Erect dense bushy shrub to 2 m.
Angophora bakeri - Narrow-leafed apple gum. Orange-pink bark Heart-shaped young leaves, longer drooping adult leaves. Cream gum-like flowers, but smaller petals, ribbed gumnuts. Anisopogon avenaceus - bearded grass, oat spear grass. Aristida vagans - mulga grass, common wire grass. Baeckea diosmifolia - Diosma myrtle heath. Small white tea tree-like flowers in Spring..
Banksia spinulosa - Hairpin Banksia. Small - med plant. Has long narrow leaves with rolled back edges, little notches at the tips and is pale underneath. Orange coloured flower brushes 20cm long. Egg shaped hairy cones. 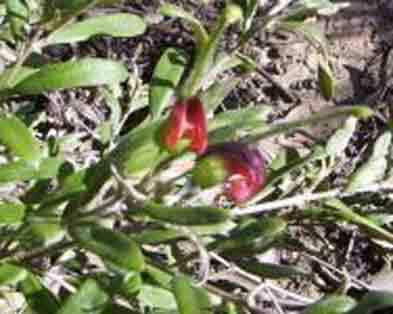 Bossiaea rhombifolia - Shrub with yellow and red showy pea flowers. Conospermum ericifolium - Smoke bush. Grey twiggy small plant with little white whispy flowers. Cyathochaeta diandra - spear grass - sedge plant. Dampiera stricta - Upright little clumping bush to 50 cm high with flowers in brilliant shades of blue in Spring. Dianella revoluta var. revoluta - Erect tussock of 70 cm long narrow leaves with inward-rolled edges. 1 m tall flower stems produce loose open heads of blue-purple starry flowers with yellow anthers. Blue berries follow. Often called a flax. Aborigines used leaves for weaving baskets. Dillwynia retorta - Egg and bacon plant. Twiggy erect shrub to 2m. Narrow twisted leaves. Bright yellow pea flowers with red blotch in centre in Spring. Entolasia stricta - Wild Panic grass. Eucalyptus agglomerata - Blue-leaf Stringy bark. Eucalyptus capitellata - Brown Stringy bark, flowers Summer. Eucalyptus fibrosa - Broad-leaf Stringy bark. Eucalyptus parramattensis subsp. decadens - subsp of Parramatta Red gum. Eucalyptus signata - Scribbly gum. Pollen has been tested as 29% pure protein. Very rich, although vaiable quantity. Eucalyptus sparsifolia - Narrow-leaf Stringy bark. Sm-med tree, long stringy bark. Small leathery shiny leaves. Grevillea montana - Mountain Grevillea. Grows only in the Hunter Valley. Muswellbrook to Kurri - general area. Grevillea parviflora subsp. 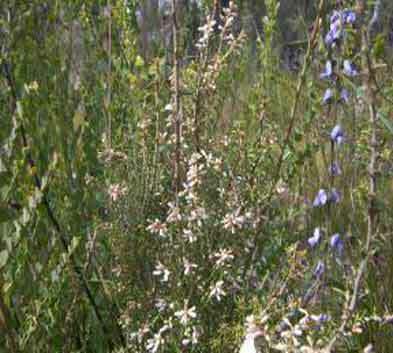 parviflora- unique to Kurri area. Small shrub to 1 m. Delicate tiny pink Grevillea flowers Sept - Nov. 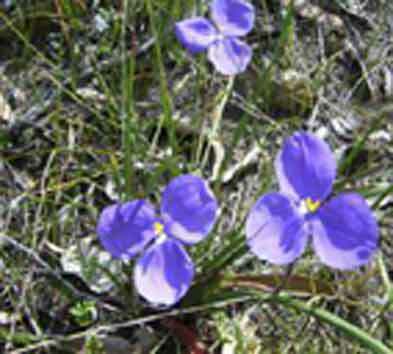 Ground Orchids - About 30 varieties of ground orchids have been listed for KSSW. Haemodorum planifolium - Blood root. Grassy plant with strappy leaves and blackish flowers on a long stalk.Orange-red roots. Hardenbergia violacea - False Sarsparilla, beautiful rambling or climbing plant, purple pea flowers early Spring. Hakea dactyloides - Finger Hakea. Large shrub. Silky bronze new leaf growth. White flowers in clusters Spring. Hovea linearis - Legumous small plant with showy purple pea flowers along the stems. Early Spring to early Summer. Isopogon anemonifolium - Drumsticks. A small upright shrub with flat divided leaves and globular heads of bright yellow tubular flowers. When flowering is finished, a hard grey wooly drumstick remains. Jacksonia scoparia - Medium- sized, slightly weeping shrub with masses of golden pea flowers in Spring on mostly leafless banches. Dogwood, the bark smells awful when wet. Lambertia formosa - Mountain devil. A medium shrub with narrow sharp- pointed leaves and clusters of red-orange flowers through Spring and Summer. Bizzare woody, horned fruits follow. Flowers are rich in nectar. Years ago, in the Blue Mountains, they used to dress these fruits and sell them to tourists as strange little dolls. Leptospermum polygalifolium - Large 4m tea tree. Thick angular branches with slightly weeping habit. Oil glands on oblong leaves. White flowers with green centres, Spring into Summer. Leucopogon ericoides - Eric heath. Beard heath. Prickly shrub to 1m. Dark leaves that end in a sharp point. Flowers are born at the end of branches and are strongly perfumed. White recurved petals. Very frilly around edges. Flowers Spring. Leucopogon virgatus - Small heath plant with thin, wiry branches. 50cm hairy branches Deep pink flower heads. Light fragrance. Lissanthe strigosa - Peach heath up to .5m high. Stiff linear leaves. Profuse bell flowers Aug-Nov.
Lomandra longifolia - Spiny-headed Mat rush. Tufted. Long flat ribbon leaves 1m long with sharp edges. Used by Aborigines to weave dilley bags and mats. Creamy golden flowers in tall thick cluster. Spiny bracts. The inner leaf bases are edible and are supposed to taste like peas. Macrozamia flexuosa - Primitive, Cycad-like plant with central cone like a pineapple. Melaleuca decora - Small slender tree with brownish-white papery bark. Leaves are linear, some times lanceolate and have one side channelled by a grooved midvein. Oval heads of cream or white flowers on ends of branches in Summer. Sweet perfume. Melaleuca nodosa - Ball Honey myrtle. Dense growth to 3m. Many slender spreading branches. Fine stiff pointed leaves. Abundant globular balls of yellow flowers in Spring to early Summer. Early morning perfume. 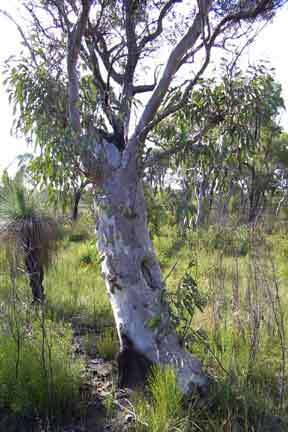 Melaleuca sieberi - Siebers Paperbark. Melaleuca thymifolia - small shrub 1m x 1m. Purple flowers. Small aromatic leaves. Claw-shaped flower heads. Patersonia sericea - Silky purple flag. Low clumping species. Small tuft, gass-like leaves from a rhyzome. Plant covered with silky hairs. Deep violet flowers on stems 30cm high. Flowers last only a few hours but are profuse, Spring and Summer. 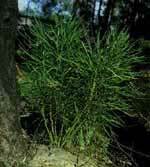 Persoonia levis - Broad leaf Geebung. Up to 5m high. Leathery lance-like leaves which have 3 distinct veins. Layers of papery bark revealing deep red colour underneath. Small bright yellow flowers, often in racemes along the stems in Summer. Succulent edible purple fruits follow. Phebalium squamulosum - Scaly Phebalium. An erect, compact shrub to 2 m or more. The alternate leaves are linear to oblong with rolled under-edges. They are dark green above, white underneath with brownish scales. 5-petalled yellow flowers with prominant stamens make up the flower head. Main flowering time in Spring. Pimelia linifolia - Nodding or slender Rice flower. Small showy plant with narrow leaves, beautiful pink-white flowers Spring. Stylidium graminifolium - Grass Triggerplant. Small pink flowers on a long stalk that rises from a base of tufted leaves. A sensitive trigger flicks over to dab pollen on bees and other visiting insects. 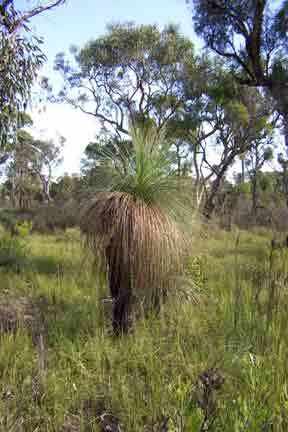 Flowers Dec to Feb.
Xanthorrhoea glauca - Grass tree. Wonderful, uniquely-Australian plant. Rich in nectar, attracting many honeyeater birds. The Aborigines obtained starch from the upper trunk; soaked the flowers in water to make a sweet drink; ate the tender young shoots; collected gum for making glue and used the flower stalks for spear handles.